By far, the most confusing critter that I've come across in all my piscatorial pursuits is the rainbow trout (Oncorhynchus mykiss) even though its one of the most common fish in my neck of the woods. In fact, to illustrate just how confusing of a beast it is, the fish in all of the pictures in this post are technically rainbow trout (or a subspecies of rainbow trout) of one form or another. Without further ado, I would like to introduce you to a fish that you probably recognize, though perhaps not by its proper name - the Columbia River Redband Trout (Oncorhynchus mykiss gairdnerii). In November of 2012 some colleagues of mine needed help catching fish to tag in the Sanpoil River in Northern Washington, and as it turns out I know how to do that. So they enlisted my help. It's a tough job, but somebody had to do it right? It's always fun to get to fish while on the clock! This lucky fish not only gets to be the poster child for his species on my blog, but he is also providing my colleagues valuable data on migration and habitat usage in the Sanpoil River Basin (note the antenna of a radio tag protruding from its side). So what's the difference between the redband trout (O. mykiss gairdnerii) and the plain old rainbow trout? Franky, not much really. But before answering that question more, I need to explain a little of the biogeography of the rainbow trout. This enterprising critter is by a long-shot the most widely stocked fish in the world. They're only native to the west coast of North America and the east coast of Asia; however, because of their popularity with anglers and their ability to survive in diverse places, they have been very widely stocked and can now be found on every continent except Antarctica. Heck, I myself have caught them on two different continents. The result of this artificial propagation, stocking, and spreading is that most populations of rainbows are genetically mixed. A particular body of water may have been stocked with fish of Californian, Canadian, and Idahoan stock just to name a few. In fact the stocking has been going on for so long and policies have changed so many times that it's hard to find any stock of "native" rainbows that hasn't been genetically infiltrated by hatchery fish. Here's a typical "mutt" of a rainbow. Born in a hatchery and definitely of mixed stock. still fun at times (just ask my kid) but don't try to dig too deep into his genealogy, it gets murky pretty fast. The Henry's Fork rainbow is probably one of my favorite fish to chase anywhere. However, this too is a "mutt" of sorts. 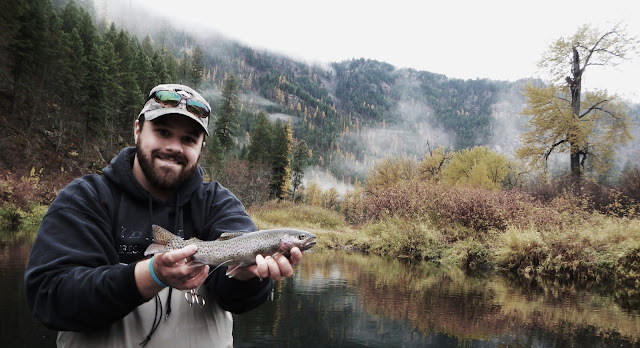 Although the fish in the picture wasn't born in a hatchery, rainbows are not native to that river; they were introduced using several different hatchery stocks - still awesome to chase with a fly rod though! This yellow oddity is a "banana trout", a rainbow trout that through mutations and artificial selection in the hatchery lost it's normal skin pigment (sort of like an albino). 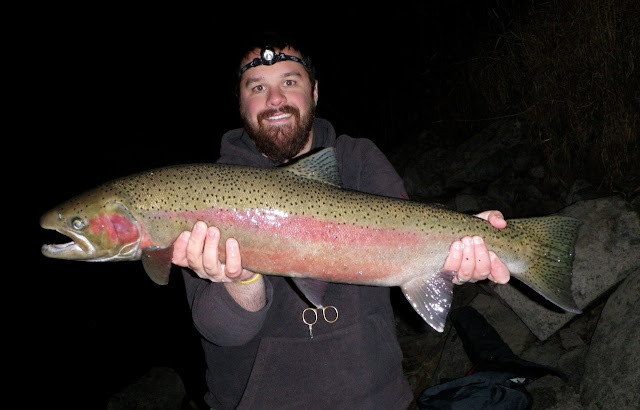 This steelhead is also a hatchery rainbow (see below for further explanation). 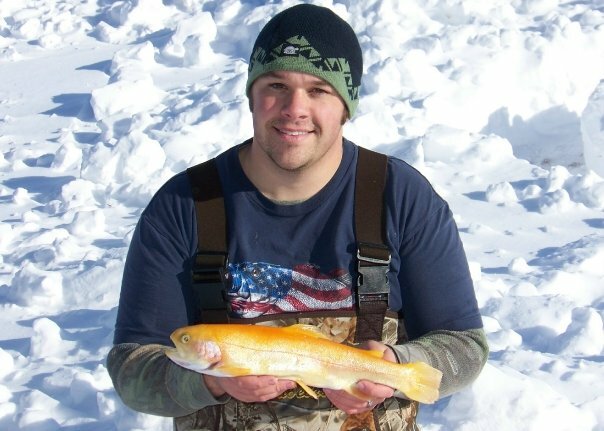 The golden trout - According to the American Fisheries Society guidebook, these guys are their own separate full species, Oncorhynchus aguabonita; however, many scientists have prefered to lump it together as a subspecies of rainbow O. mykiss aguabonita. Either way it's native to the Sierra Nevadas in California but can be found in high mountain lakes throughout the west, and they're about the prettiest fish ever invented. I caught this one in Lake Aintgonnatellyouwhere in central Idaho (see this post for details). Now enter the redband trout. Native rainbow trout from the Columbia River Basin are divided into two subspecies: the coastal rainbow trout (O. mykiss irideus; I still need one of these for my list) which are found west of the Cascade Range, and the more inland redband trout (O. mykiss gairdnerii) found east of the Cascades including most of Idaho and good portions of Washington and Oregon. Don't ask me what the differences are between the two subspecies, because they both look pretty much the same to me. Redbands have a more pronounced red band down their sides (duh...) but that's about it. But since there has been so much stocking and hatchery influence everywhere, the native "pure" forms of these fish are mostly found in certain scattered rivers and streams. You can definitely find them if you want to but you have to know where to look. Just for fun, I'll now complicate things even more by pointing out that ranbow trout and steelhead are both the same species, even though they look very different. Steelhead (rainbow trout that have been to the ocean and back) can and do spawn with rainbows (steelhead that never went to the ocean) and vice-versa. Also, two steelhead can spawn and their babies can become resident rainbows; and likewise, two resident rainbows can spawn and their babies can become steelhead. What this means is that all native Idaho steelhead, being from the Columbia River Basin east of the Cascades, are technically "redband steelhead" though nobody ever calls them that. 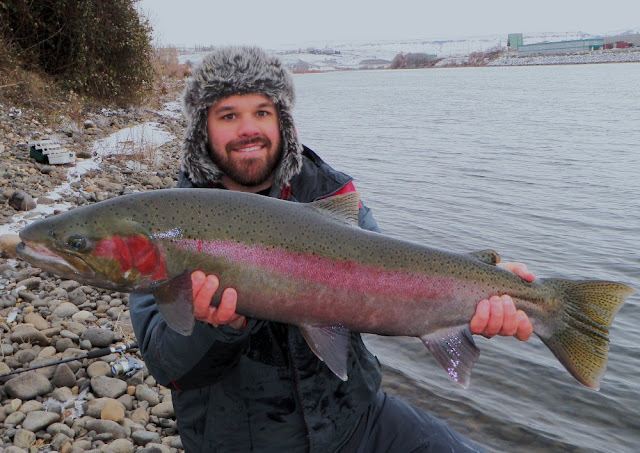 This wild Clearwater River steelhead buck is a fine specimen of an ocean-going redband trout (for the full story of this particular fish see this post). So while I admit that technically I had previously caught a redband trout (in steelhead form), those stream-resident ones I caught that day in the Sanpoil River were a first for me, even if it's not technically a new species. I caught fish up to 20 inches that day, but the colors of this little juvenile Sanpoil River redband were hard to beat. Many books and countless journal articles have been written about the rainbow trout in an effort to make sense of this complicated and ubiquitous species. I don't pretend to understand a fraction of it all but I do know that they're a lot of fun to catch no matter what you call them.